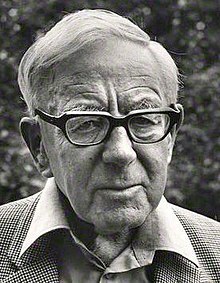 Alan John Percivale Taylor (25 March 1906 – 7 September 1990) was an English historian who specialised in 19th- and 20th-century European diplomacy. Both a journalist and a broadcaster, he became well known to millions through his television lectures. His combination of academic rigour and popular appeal led the historian Richard Overy to describe him as "the Macaulay of our age"
In 1917 European history, in the old sense, came to an end. World history began. It was the year of Lenin and Woodrow Wilson, both of whom repudiated the traditional standards of political behaviour. Both preached Utopia, Heaven on Earth. It was the moment of birth for our contemporary world. Psychoanalysts believe that the only 'normal' people are those who cause no trouble either to themselves or anyone else. If there had been a strong democratic sentiment in Germany, Hitler would never have come to power . [Germans] deserved what they got when they went round crying for a hero. Bismarck fought 'necessary' wars and killed thousands, the idealists of the twentieth century fight 'just' wars and kill millions. Fascism was little more than terrorist rule by corrupt gangsters. Mussolini was not corrupt himself but he did nothing except to rage impotently. American statesmen might like some Europeans more than others and even detect quaint resemblances to their own outlook; but they no more committed themselves to a particular group or country than a nineteenth-century missionary committed himself to the African tribe in which he happened to find himself. Manchester has everything but good looks..., the only place in England which escapes our characteristic vice of snobbery. Psychoanalysts believe that the only "normal" people are those who cause not trouble to either themselves or anyone else.